'Is there anybody here not concerned about money?' Nikolai Ishchuk asks his audience - the select crowd who gathered at Diemar/Noble gallery last Tuesday night to here him talk about his larger than life series of photographs Big Bucks. Below is more of what Ishchuk had to say on the night. It's a bit of a read, but hopefully you'll find it interesting. 'To understand money, we need to look at capitalism and the fact that money is essential to it.' Ishchuk continues, 'under capitalism money is the only thing that people make is money in return for labour and time - then they go and buy things. Because we no longer participate in the production of that which we consume, we don't really know how much it really costs, and what happens - in advanced capitalism - is that we start pricing desire. This is how money gets to misrepresent reality. 'Capitalism is obviously geared towards mass production. At the same time it produces the elites who sit at the top of the system, but they don't want to consume that mass product because they need something to differentiate themselves, to assert their status. They desire fine things rare things, something were considerations of pure monetary value are no longer a concern to them. 'Art in many ways is the antonym for mass production - is not anonymous, it is made in small quantities, and it would seem that artists create value out of nothing and out of nowhere. They create something that other people will pay a lot of money for. Lewis Hyde - author of The Gift - argues, says Ishchuk, 'that capitalism can't price art adequately because when you make and display art, you're sharing your talent, your gift with other people and it's not an economic transaction to begin with. So art has a very uneasy relationship with money. 'Art is subject to more forces, just like anything else, there are dealers, art galleries, auction houses, where art is sold and resold at a profit, these agents compete between themselves, artists compete between themselves, which gives rise to new styles and then movements. So how does this fit in with the images Ishchuk has created? 'These days art and design go hand in hand, if we were to isolate any single pattern on a bank-note, we'd have no problem classifying them as art, they are all subject to copyright like any other work of art - mine certainly has an air of magic about it, because if you had a lot of it, all your problems would be resolved, it defiantly has cult value. 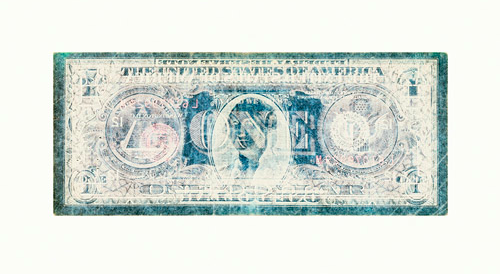 'The funny part is, it's also like the mother of all unlimited editions, but each copy holds the same value as the one before, a banknote has the characteristics of this theoretically perfect work of contemporary art, just that we don't really look at them that way, but all that we need to do it release it's exhibition value to achieve that 'art status. 'I wanted [the images] to be big, I wanted them to be recognisable, but still dreamy and fictional because money is fiction in many ways - we have so much faith in it, but think about how it can all be rendered null and void by decree over night. When we read about the high net worth individuals, very few of us actually think about that they can never fully realise that wealth because the moment they start selling it off it's going to depreciate; we're constantly bombarded by these inflated figures which don't mean that much. LookSeeNow featured Nikolai Ishchuk's photographs as one half of Big Bangs, Big Bucks in January - the second half of the show exhibits the explosive works of Geoffrey H. Short. The exhibition, Big Bangs, Big Bucks, is on show at Diemar/Noble on Wells Street, London until 14th March.